ROM Hacks: Vixen 357 New balance! Vixen 357 is a turn-based strategy game in the style of Langrisser and shining force, from the same producers of Assault Suit Leynos; The main theme of the game focuses on a futuristic combat using mehcs called VECTORs and SERDs, all played in an anime style like gundam series. The original game was only released in Japan, but currently there are translation patches available in different languages. Vixen 357 - Armored warrior, is a hack that gives a new balance to the original game, making the gameplay faster and less frustrating, and motivates you to try new different tactics to fulfill the missions objetives; For example: one of the main negative points in the gameplay, was that some weapons had a mediocre damage and an awfull accuracy, making these weapons totally useless! with the new balace, weapons with this failure have a better performance making them more useful items even in the final missions. Also, the statistics of all units own, allies and enemies have been adjusted to prevent some of them being stronger and others weaker, and at the same time, giving them different roles as snipers, melee figthers or gunners. An aspect that causes some confusion in the original version, are the abbreviations that are used to indicate the mechs statistics, so in the new patch have been changed by the most common abbreviations of the RPG. 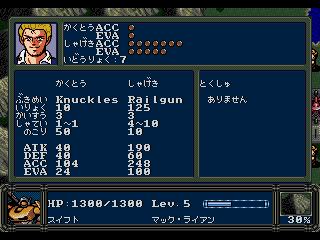 This hack is designed for the Japanese version, but it is compatible with the translation patches. If you like strategy games or you are looking for an authentic hidden gem, you should give this game a try. Re: ROM Hacks: Vixen 357 New balance! Any balance to Vixen is welcome, this game is ridiculous in original form and needs to be played in a particular sort of way to even progress through the story. 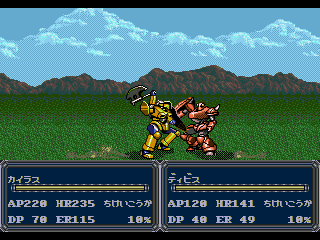 It's best to think of this as a prehistoric Langrisser which NCS developed later. Anyway, I'd welcome a "make the game way too easy" patch so that the story can be played through and enjoyed. A guide to ROM offsets would be welcome, if the original author has any notes lying around?